According to the report of Human Rights Activists News Agency in Iran (HRANA), Marjan Davari, 50-year-old researcher and translator, had been arrested on September 24, 2015, after the closure of Rah-e-Marefat publisher and detention of all officials in this institute. An informed source told HRANA’s reporter, “Rah-e-Marefat, under the direction of the head of the institute, Mr. Zargar, was a meta-physics research centre that intended to establish a university major in meta-physics in north of Iran as well; even a building was built for this purpose which has been confiscated”. Need to be mentioned that HRANA has received a report regarding the death sentence of Mr. Zargar as well. However, this news agency is unable to confirm this news independently and is still trying to find more information about it. Ms. Davari was born on April 24, 1966 in Tehran. Ms. Davari finished elementary school in UK and after returning to Iran, in international Partian school. She received English translation diploma when she was 13 and continued her studies in Al-Zahra University in graphic and painting, in addition to research and translation in inner-science, eastern and western ontology. She concentrated solely on inner-science and eastern ontology and worked as one of the researchers in research and studies of meta-physics institute. 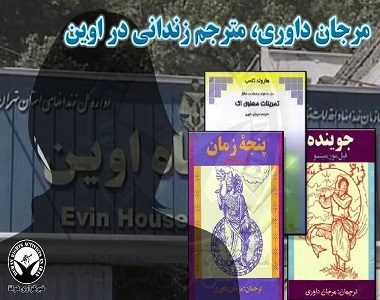 In addition, she started publishing translation of books in Eshraghi school of thought in 2010. Eckankar is a new spiritual movement that was funded in USA in 1965.